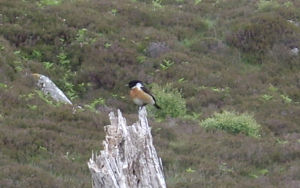 Observation - Stonechat - UK and Ireland. Description: It sat , singing for some minutes, but unfortunitly at some distance so my zoomed photograph is not fully focused, must get a better camera! It sat , singing for some minutes, but unfortunitly at some distance so my zoomed photograph is not fully focused, must get a better camera!